Last minute for your Easter Holidays ! How to get organized for your holidays ? Looking out over the Iles d'Or islands, leave the beaten track for an unforgettable get-away at Le Pansard! Nestled between the hinterland and the turquoise sea, you'll stay in a delightful setting, with no need for a car, under the bright skies of the Côte d'Azur. The advantages : Semi-covered raised wooden terrace. For your everyday needs, take advantage of the standard services: bar-restaurant, grocer's, general store, games room, pizzeria and take-aways. You'll also appreciate the games area and, in the high season, a kids club (5-10 years), sporting activities, 2 dances per week, and nearby water sports: diving, windsurfing, fishing, etc. A sure-fire recipe for totally relaxing holidays! 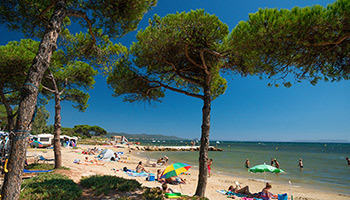 La Londe des Maures is a famously sunny seaside resort (more than 300 days of sunshine per year) This small town has managed to retain its natural exotic environment, with its golden beaches,, hills, vinyards, farms and olive trees. 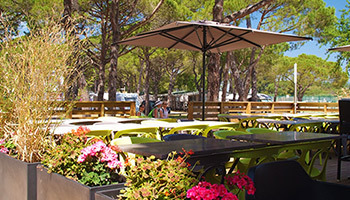 Designated Le Pavillon Bkeu European for the quality of it's beach water and its marina. Day-trips to Porquerolles, Port Cros, coastal boat trips, cruises around the 2 islands. 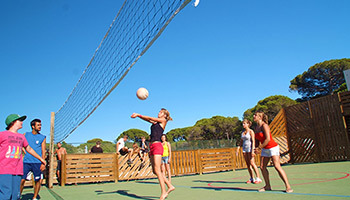 La Londe Les Maures is a resort that enjoys particularly high levels of sunshine (over 300 days of sunshine per year). This little village has managed to preserve its natural environment and exotic touch, with golden sandy beaches, rolling hills, vineyards, farms and olive groves. Awarded the European "Pavillon Bleu" for the quality of the water on its beaches and in its marina, Port Miramar. Also awarded the "Tourism and Disability" and "Garden Villages" labels. Porquerolles, Le Levant and Port-Cros (Europe's leading terrestrial and marine national park). Miramar: long, wide beach with fine sand. Readily accessible for people with a mobility impairment. Aquaboume bumper boats, bouncy castles, trampolines. - Tamaris: small beach that is home to the local water sports centre. - L'Argentière: sandy beach, partly beneath the pine forest. Awarded the Tourism and Disability label for 4 types of disability. - L'Estagnol Lagon: good for toddlers. Discover the heritage of the land. See what a classroom was like in 1903. 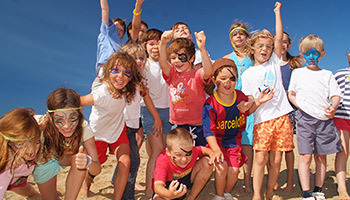 Baby sail boat, optimist, windsurf, sailing courses, catamaran. A l'eau Plongée 83 : first dives, explorations, training courses, flipper excursions. How to get to the campsite? A7 motorway - A8 motorway towards Aix en Provence then towards Toulon - Drive through Toulon, join A57 then A570 towards Hyères - Continue onto RN98 towards Lavandou/St Tropez. Exit at La Londes Les Maures. A8 motorway - A57 towards Toulon - Take A570 towards Hyères - Continue onto RN 98 towards Lavandou/St Tropez. Exit at La Londes Les Maures. When are you leaving ? What type of accommodation ?